Dan Foley just posted up 9 minutes and 30 second of Larry Edgar, Ryan Nyquist, Dylan Lewis, Kris Fox, Jason Watts, Cody Pollard, Chris James, and Corey Walsh absolutely destroying the bowl at Five Dock following practice at the Vans BMX Cup in Australia. 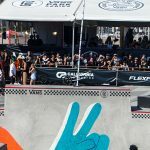 This entry was posted in Video and tagged 2017, Australia, BMX Cup, Chris James, Cody Pollard, corey walsh, Dan Foley, Dylan Lewis, Five Docks, jason watts, Kris Fox, Larry Edgar, Ryan Nyquist, Sydney, vans. Bookmark the permalink.